A practicing Buddhist, active at the local Zen Temple since the late 1990s, Moore said the anxiety she experienced after her accident tested her spiritual practice and caused her to re-evaluate her life choices. Extensive rest and rehabilitation meant weeks out of work. It was during this time that Moore relied on her Buddhist meditation practice to help her sit with her the pain and anxiety she lived with daily after the accident. Meditation, she said, brought her to a feeling of surprising aliveness, which in turn, motivated her to want to help people experiencing similar traumas. And so, after her recovery, Moore became a hospice volunteer. Moore participated in the By Your Side program, which entails sitting with patients who are dying alone. Moore also visits to relieve caregivers, keeps patients company, or offers threshold singing. “If there is a sense of feeling the presence of God in a room, that’s where I have most felt it,” said Moore, who was named Volunteer of the Year at Michigan’s 2009 conference for hospice workers. If there is a sense of feeling the presence of God in a room, that’s where I have most felt it. The work made such an impact on Moore personally, in fact, that it prompted her to change career paths. While still working part time at her university research job, she became a seminary student at Chicago’s Mead Lombard Theological School, training to become a hospital chaplain. Moore says that she didn’t realize right away that her response to the accident would lead to a career change, but one thing was immediately clear as she wondered whether there would be long-term repercussions from her injuries. Barbed wired surrounding the perimeter of the prison where Moore taught meditation and Buddhist religious services for nearly a year. Her pursuit of the answers to these questions led her not only to hospice bedsides, but also to the Huron Valley Women’s Correctional Facility, which houses nearly 1,000 federal prisoners categorized at security levels I, II, and V, according to its website. In her quest to alleviate suffering in the world, Moore also spent nearly a year teaching a meditation class and a Sunday morning Buddhist religious service to inmates there. She said she was drawn there by strong feelings about how people in American society land behind bars, which she describes below. Moore said she became quite attached to the women in her classes and found it hard to say goodbye. 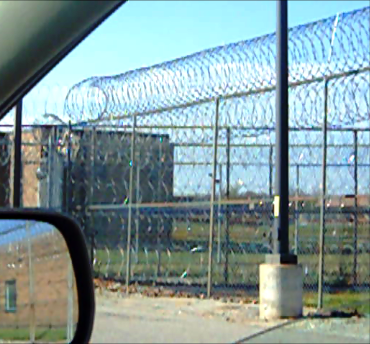 But eventually, the prison work had to give way to make space for a chaplaincy internship at St. Joseph’s Hospital in Ypsilanti, Michigan. Additionally, as part of her seminary training, Moore became a Minister Intern at the Northwest Unitarian Universalist Church in Southfield. Moore says that while ministering at the church is less intense than being at the prison, the hospital, or hospice, the people in her congregation have needs that are just as profound. “For patients and prisoners, pain is part of their identity. Their pain obvious to all of us. They have IVs in their arms. They are literally behind bars,” she notes. ~For Washtenaw Community College, March 2012.
nicely done Lindsay. Tisha is adorable and what a compelling story.